Blackmagic Camera Fiber Converter - Z Systems, Inc. Multiple channels of talkback with headset connections. 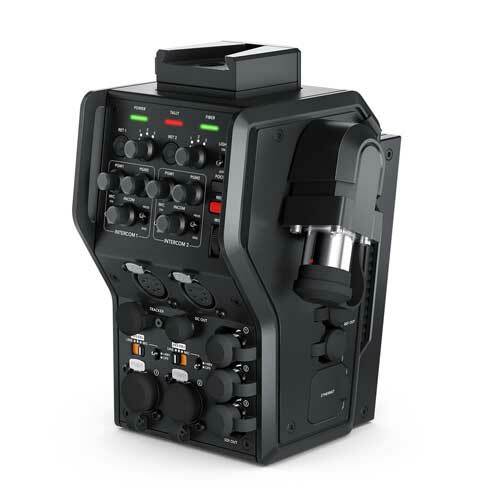 The Blackmagic Camera Fiber Converter attaches to the back of your URSA Broadcast camera so you can use and power it remotely from a Blackmagic Studio Fiber Converter up to 2 km away! You get an Ultra HD camera with 3 return feeds, multiple channels of talkback, tally, control, PTZ, tracker and much more, all down a single SMPTE standard optical fiber cable. You also get a backup talkback link so you can still support and diagnose problems if the fiber link is offline. The studio and fiber converters constantly monitor power for any kind of damage to the power wires in the cable. If damage or a power leak is detected, the power is instantly shut down to eliminate any danger. The link between the camera and the studio end is standard 10G Ethernet so your video and return feeds are all IP video based. The converter can be quickly swapped for a battery plate at any time if you want to reconfigure the camera for regular production work.